Guys I finished a game. I’ve highlighted the achievement you get for beating the story. The one to the left of it is for beating all the competing drivers, which you get after the last bonus race. I haven’t finished a game in a while. I left Forza Horizon unfinished in 2012, and it turns out I’d played about half of it. 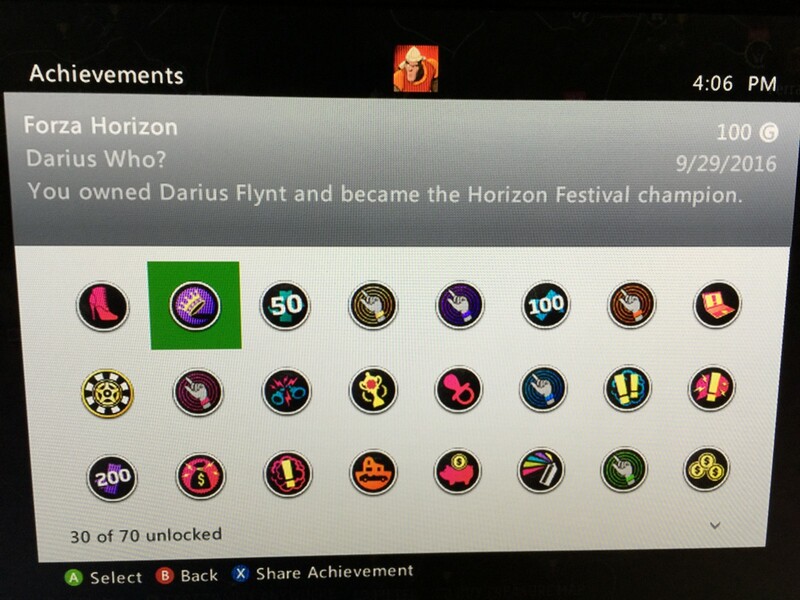 I started from scratch recently on the Xbox One, and played through the main story and a bunch of the optional races. Here are some thoughts. It’s still quite pretty, as I detailed in a recent post. The graphics and the racing physics are its strongest attributes. The racing sim components come straight from Forza 4, and the cars are modeled well and fun to drive. Unfortunately, the actual races aren’t nearly as fun as they could be, particularly near the end. The course design is basic, and many races are short and same-y. By the last couple hours of my 10- or- so hour run through the game, all the races felt exactly the same. Every main race is either a lap-based contest against 8 other drivers, or a point-t0-point race against 8 other drivers. Some cool Showcase Events mix things up…but they’re kind of just time trials. It feels a little like all the work went into the cars and the visuals, and they didn’t have time to make each late game race distinct. That’s a problem when there are 70 main races in the game and several bonus ones. The sound is good, although I noticed some issues with the dynamics, and occasionally cars would have identical engine noises. Perhaps a limitation of the 512 megs of RAM on the Xbox 360? I don’t know. Forza Horizon is a solid game, and its visuals have aged well over time. The driving physics are still as fun and well-modeled as ever. And the World of Colorado is great. The 300 cars are all fun to drive. But the track design eventually let me down. With such a huge open world, you’d think that more of the races would take place over wide swaths of land…but only the very last 10-minute bonus race agains the final boss does. The rest of the game starts to feel monotonous by the end, and I started approaching it as a list of tasks I needed to finish instead of fun races to play. I’m still happy I finished it after four years, and I’m probably going to check out some other Forza games in my library I’ve left unfinished. But hopefully they have more track variety as I get deeper into the game. I create things I sometimes like. I do radio voice work by day. I studied film and production. I love audio, design, and writing. Also video games.